Thanks to everyone's great advice, I'm starting to narrow down our choices for our power outage solar backup system. First of all, Joey and Roland (and the web) helped me figure out what size system I should be looking for. I added up two hours run time on our laptops, router, and two lights and came up with 150 watt-hours per day. Using Joey's math, or just dividing by the 3 peak sun hours our area is rated to receive in the dead of winter (from the map above), we would need a 50 watt solar panel to achieve our goal. 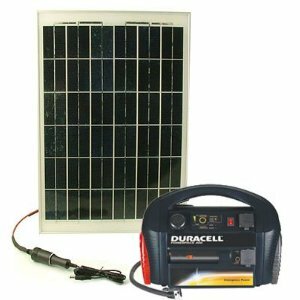 Since it's bad business to discharge your batteries more than halfway, we would need to buy two Duracell Power Packs and two 25 watt panels to reach this level --- total cost roughly $450. He also mentioned buying a tilt mount ($68), which would let us adjust the panel's orientation seasonally for slightly higher output. Assuming Mark could make our tilt mount, but that we would have to buy some connectors not on the list, the total would come to around $600. On the other hand, I suspect I could shave around $100 off the cost by hunting down the components elsewhere on the web. In other words, the plug and play version and the real DIY version have a comparable price tag. But do they have comparable longevity? I asked the Backwoods Solar salesman what he thought of using a 600 watt Duracell Power Pack as our battery, controller, and inverter. "That would probably work," he said (and I paraphrase), "if you're just going to use it very ocassionally as a backup. However, if you'd like to take the laptop and lighting loads permanently off the grid and run your solar system daily, you would be better off with a different battery." Now, I trust that he knows what he's talking about, but I don't quite understand why he would be right. My research shows that AGM batteries have a rated lifespan of 4 to 7 years while marine batteries have a lifespan of 1 to 6 years. In addition AGM batteries are sealed, which means no need for us to fuss over them, worry about fumes, or freak out when I accidentally knock them over. Finally, they can be shipped, so we can shop around and buy the ones at rock bottom prices on Ebay. As far as I understand it, the main disadvantage of an AGM battery is price, but the cost of the Duracell Power Pack seems to be roughly comparable to a marine battery when you consider that the former includes a charge controller and inverterter. So, I'm opening up to questions and answers again. Can anyone think of a reason that the Duracell Power Pack would have less longevity than a different system? Currently, I'm leaning toward trying out one 25 watt plug and play system, doubling it later if all goes well. Our homemade chicken waterer helps your hens cope with the heat. while the batteries may have similar live spans, the fact that one failure of the duracell system results in purchasing a whole new system for $150 rather than just a new part will probably end up costing you more in the longterm. I got a duracell carjumper battery. that failed at less than a year. I would go with the more reliable marine batteries. They also have more durable charge/discharge life spans. I think for the price difference I would want to go with the built unit for its expandability. Also with separate parts, not only is expansion easier, but it will be easier to replace individual parts. All the big box stores sell inverters and batteries. What about checking with a RV store in your area or craigslist. The batteries and inverter could be salvaged. I got hardly used batteries from ours for our camper for about 1/4 the normal price. Salesmen there told me that some people change out their batteries once a year no matter what, so they always have good used batteries. My dad has found the same thing to be true at the marinas in Florida. Check out the solar irradiation webapp from the NREL. If you look at the average irradiation difference between January and July, using the "flat plate tilted south at latitude" option, you'll see an irradiation of 3-4 kWh/m²/day in Januari and 6-7 kWh/m²/day. Multiply that by the effective size of your panel and it's efficiency, and you know what you can expect in terms of electrical energy. A panel of ½ m² and 10% efficiency would get you 3500·0.5·0.1 = 175 Wh per day in winter and 6500·0.5·0.1 = 325 Wh per day in summer. So one such panel should suffice in winter and have power to spare in summer. If you know the size of the 50 Wp panel, convert it to m² and multiply by 1000 W/m² which is the standard sunlight strength that the panel is rated at. This will yield the power of the sunlight falling on the panel. Divide the 50 W by the result of the previous calculation and you have the panel's efficiency. Let me restate that a MPP tracker is essential for high efficiency of the panel, due to the characteristics of PV panels! As to which battery is best, that's hard for me to answer. An AGM battery is nothing more than a lead-acid battery with some fiberglass between the plates. This will prevent the plates from shorting out by touching or forming dentrites, which are known failure mechanisms with standard lead-acid batteries. According to [Peukert's law], the capacity of a lead-acid battery depends on the rate of discharge. See some examples. In short, the more current you draw, the less your actual capacity. The benefit of buying from comapnies like Backwoods is that it's a single stop shop. If something doesn't work, you call them. If you buy components all over and something doesn't work, you might get a lot of suppliers pointing fingers at each other. The disadvantage of the Duracell powerpack is that the invertor is always drawing power, even if you don't use it. According to the specs it's <0,2 amps (inverter no-load current), but still. As a consumer product, I don't think it's made for heavy use. I'd go with something more solid like traction batteries. There is an interesting battery FAQ that you might find useful. It lists typical lifetimes of batteries. Pay attention to the pieces about temperature and cycling, and AGM versus standard wet cells. Erich --- actually, duplicity is one of the reasons we like the idea of the plug and play version. For the same price, we could set up two unique systems with interchangeable parts, versus one big system. So, if something went wrong on our double plug-and-play, we'd likely be able to cobble together at least one system that would give us half the juice, versus one that would give us nothing (until we were able to replace parts.) On the other hand, you and Anonymous both do make the good point that the DIY version would probably be cheaper to maintain in the long term since you could replace those parts individually. Interesting idea about used batteries. I need to read more, but the forums I've perused so far seem adamantly opposed by buying used batteries. Thanks to everyone for their great advice! Aren't you running a freezer? We do run a freezer --- that's why we have a generator. But it's not worth running the generator for hours just to play and leave the lights on. That's the gap we're hoping to fill in. Why move them? I suspect that the golf cart's batteries are connected in series, and you'd need them in parallel for the PV system. So wire the batteries in parallel to an external cable, which you then can connect to your PV setup if (and only if) the golf kart's power switch is off. That should to the trick without hauling batteries around. I'd recommend you to to invest into an extra switch that either connects the batteries in series to the motor, or in parallel to the external cable, for the sake of safety and foolproofing. You might want to consider building a "garage" to house your battery bank and golf cart, especially for the winter. Batteries don't like cold or freezing. A garage for the golf cart has kinda-sorta been on the list for a long time, but it never makes it near enough the top to happen!